I have been talking turkey and Thanksgiving the past few weeks and today I am finally bringing you a Thanksgiving dessert! I don’t know about your family but at our Thanksgiving dinner, we always have a plethora of desserts. From pie (Thanksgiving wouldn’t be Thanksgiving without pie), to cake, to cookies, to brownies! Oh what fun it is to grab a plate and spoon bite sized (‘bite sized’ ha! Who am I kidding!) portions of all the desserts onto your plate and dig in! While Oreo cookies are not your traditional Thanksgiving dessert, I had fun ‘playing up’ Oreo’s latest variety, Gingerbread Oreos, by transforming them into the crust for a Thanksgiving style cheesecake. 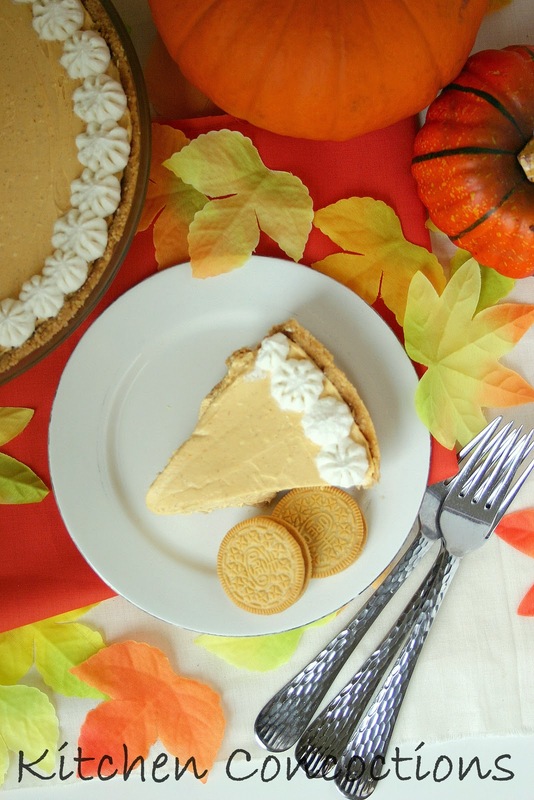 This No-Bake Pumpkin Cheesecake with Gingerbread Oreo Crust is certain to impress your Thanksgiving dinner guests. 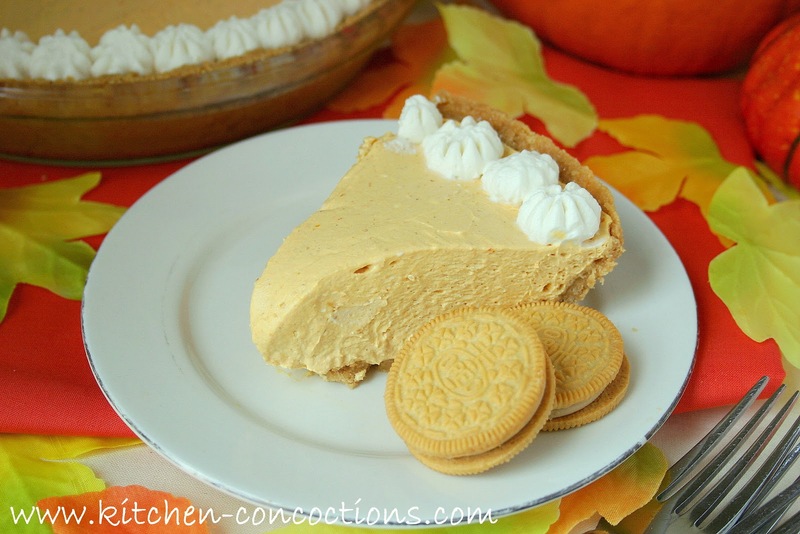 It is creamy and decadent; with a nicely balanced pumpkin flavor and thick spiced cookie crust. And what makes this dessert even more enticing for Thanksgiving, is that it is no bake (read: doesn’t take up precious space in your oven when you need to bake other things) and can totally be made a day or two in advance and stored in the refrigerator (read: one less thing to stress about on Thanksgiving). Do you like to ‘play’ with your Oreos? If so, I encourage you to ‘play’ along and participate in the “Play Up Dessert with OREO” contest, where you have the opportunity to win some great prizes for playing along. Kitchen PLAY is giving away two OREO Thanksgiving prize packs filled with goodies like a Crate & Barrel serving platter and pie server, an exclusive OREO cookbook and other fabulous treats, valued at $70. To enter, simply recreate any OREO dessert from this week’s Kitchen PLAY event or come up with your own. Post about it on your site and provide a link to that post in the comments on this Kitchen PLAY page. Multiple entries are allowed, as long as a separate OREO dessert post is created for each entry. Deadline is midnight PT on Wednesday, November 28th. This sweepstakes will also take place again at the holidays, so the earlier you enter, the more chances to win! Full sweepstakes guidelines at Kitchen PLAY. 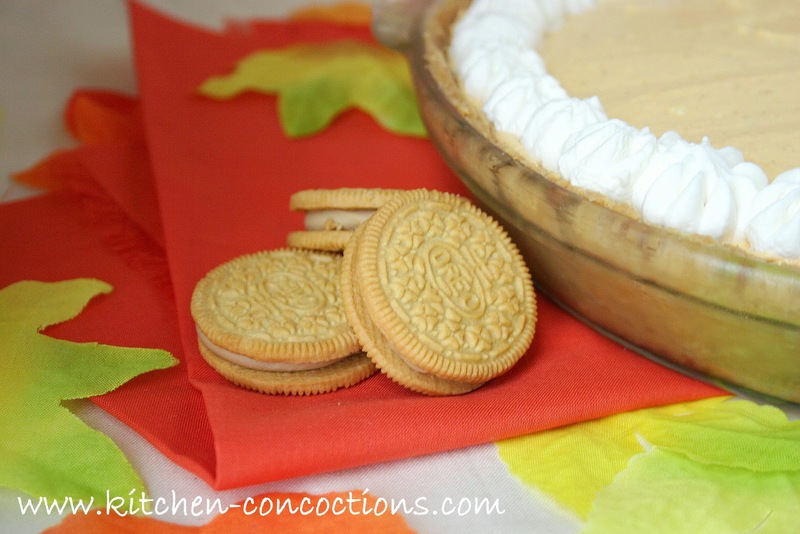 So get in the kitchen and twist, dunk, bake, and ‘play up’ those Oreos in a fun and creative Thanksgiving dessert! Working in batches, place Oreos in food processor and process until crumbly. Transfer Oreo cookie crumbs to a bowl. Stir in melted butter. Press buttered cookie crumbs into the bottom and up the sides of an 8-inch pie plate. Place pie plate in freezer to chill for 10 minutes. Meanwhile, in a large bowl, stir together cream cheese, sour cream, pumpkin puree, brown sugar, vanilla extract and pumpkin pie spice; mixing until smooth and creamy. Carefully fold in whipped topping, mixing just until combined. Pour filling into prepared chilled crust. Place cheesecake in refrigerator and chill at least 4-8 hours. Serve cold, topped with additional whip cream if desired. Note: This cheesecake can be made a day or two in advance. Make as directed and store covered in the refrigerator. Thank you so much for this recipe. I just sadly found out last night that we won't be making it to my family Thanksgiving next Thursday, so I've been trying to come up with some easy things to make for just the husband, kids and I. This dessert is perfect! I didn't even know there was such a thing as gingerbread Oreos, but now I do… and I can't un-know it. Oreos are my weakness! I looooove the gingerbread oreos! Almost better than the original. 😉 This cheesecake looks wonderful! I only found out about the gingerbread ones via your instagram! 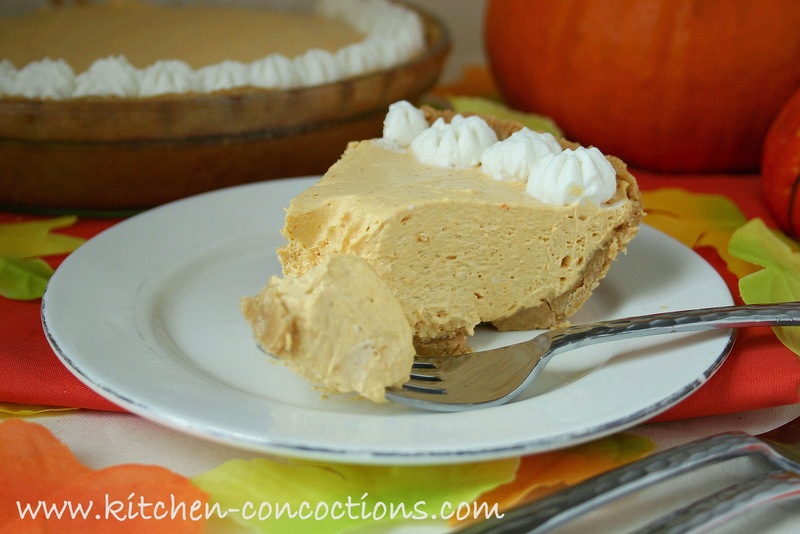 Gingery crusts are my favorite with pumpkin, and this looks like it would be perfect after a feast – nice and light. Oh man I'm so hungry & craving this now! YUM!!!!!!! Mmmm… cookie crust. I imagine it's a lot like a shortbread crust, which I love.